Botic van de Zandschulp wins in Bolton. Pedro Sakamoto lifts the trophy in Pinamar. The GB Pro Series Bolton 2019 held at the USN Bolton Arena was a success story for players from the Netherlands. On the last day of the tournament only Dutch competitors appeared in the singles and doubles finals. Singles champion Botic van de Zandschulp entered the tournament by his ITF ranking. The 23-year-old opened the competition with a two-set victory against British wild card entry Ryan Peniston. In the following round he upset top seeded British home hope and former Junior World No. 2 Liam Broady in straight sets. After fighting past No. 7 seeded compatriot Giji Brouwer in two sets, he faced German Julian Lenz in the semi-finals. Firing 12 aces during the two hours and 19 minute encounter, van de Zandschulp got the win in three tough sets with 6-3, 6-7, 7-5. The top half of the draw was dominated by veteran Igor Sijsling, who didn’t drop a set on his way to the final. After defeating No.3 seed Viktor Durasovic from Norway and French qualifier Ronan Joncour, the former ATP No. 52 and last week’s champion of Sharm El Sheikh stopped the two British players Evan Hoyt and Lloyd Glasspool. In the title match, van de Zandschulp had to survive another tough three-set-clash. After winning the first set in the tie-break, he was down 1-5 to come back into the tie-break of the second set, missing one match point. By serving 15 aces and capitalizing on four of his five break points he sealed a 7-6, 6-7, 7-5 victory in two hours and 16 minutes. Van de Zandschulp could lift his second trophy of the season, his fifth overall on the ITF World Tennis Tour. „It was a pretty tough match. I think the level was pretty good in the final. I think we played both really well and started to play even better at the end of the match. I am very happy about the win, it was a great week“, van de Zandschulp said after the trophy ceremony. Tim van Rijthoven and his partner Ryan Nijboer clinched the doubles title with a 7-6, 3-6, 10-5 victory against their Dutch countrymen Glenn Smits and Gijs Brouwer. The GB Pro Series organized by the British Lawn Tennis Association will move on to Sunderland next week with top seed Liam Broady of Great Britain, facing this week’s finalist Igor Sijsling in the opening round. Laurent Lokoli clinched the title of the ITF M25 Santa Margherita di Pula held at ASD Fortevillage on Sardinia, lifting his first trophy on Pro Circuit in 2019. The 24-year-old Corsican, representing France, assured the ticket to the final with a straight-sets win against No. 6 seed and former ATP No. 182 Peter Torebko from Germany in the semi-finals. Torebko held off 19-year-old and No. 2 seed Zsombor Piros from Hungary, who was previously ranked World No. 3 as a junior, with two succesful tie-breaks in the stage of the last eight. In the title match, played on monday due to bad weather, Lokoli met top seed Miljan Zekic from Serbia for a tough three-set clash. After losing the first set 5-7, Lokoli came back to win the next two sets with 7-5, 6-2. It was the seventh singles title on ITF World Tennis Tour for Lokoli. 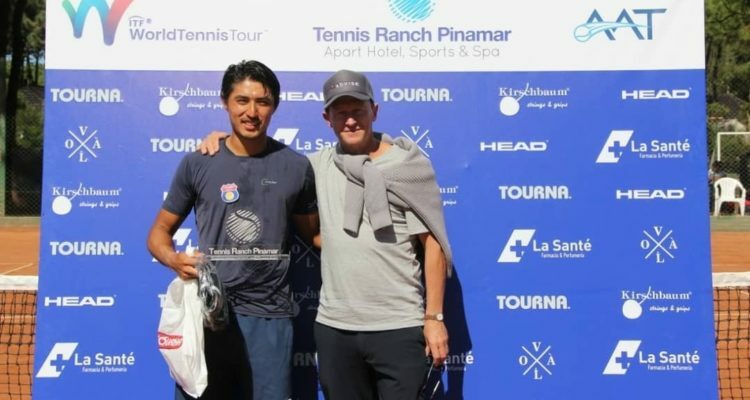 Top seed Pedro Sakamoto was the dominating player of the Tenis Ranch Pinamar Tour 3. In the semi-finals, the 25-year-old Brazilian dropped his only set of the competition against Matias Zukas from Argentina, gaining a 7-5, 2-6, 6-3 victory. Runner-up Manuel Pena Lopez from Argentina prevented the first final appearance of 17-year-old countryman Juan Manuel Cerundolo. The former No. 9 in the ITF Junior rankings had to retire in the first set, trailing 1-4. Sakomoto converted five of his 11 break point chances to defeat 21-year-old Pena Lopez 6-3, 6-3. After one hour and 45 minutes he could lift his third career trophy on the ITF World Tennis Tour, all won on clay court. The Tennis Organisation Cup 2019 held at the Starlight Resort Hotel in Antalya concluded with another win of 21-year-old Brazilian Felipe Meligeni Rodrigues Alves. En route to the final, No. 5 seed Meligeni Rodrigues Alves knocked out veteran and former ATP No. 77 Marsel Ilhan from Turkey in the semi-finals with a straight-set win. 31-year-old Ilhan held off top seed and last week’s champion Vaclav Safranek from the Czech Republic in the stage of the last eight. Unseeded Clement Geens reached his first final of the season. The 23-year-old Belgian defeated No. 2 seed Alex Avidzba from Russia in the second round. Later in the competition he stopped the run of 20-year-old qualifier Dan Alexandru Tomescu from Romania in the semi-finals. The title match was a short affair. Geens, who was former No. 8 in the ITF Junior rankings, had to retire after 44 minutes, trailing 3-6, 0-1, so Meligeni Rodrigues Alves could lift his fourth overall trophy on ITF World Tennis Tour. Lukas Klein was the dominating man at Soho Square in Sharm El Sheikh. After his title win at the same place last month, the 21-year-old Slovakian captured his second win of the season without dropping a set during the competition. The No. 2 seed faced 19-year-old Daniel Michalski from Poland in the final. Michalski, who entered the tournament on position three, battled past local hero and top seed Youssef Hossam in the semis, rallying 3-6, 7-5, 7-5 after two hours and 34 minutes. Klein prevailed in the title match by serving 10 aces in one hour and 12 minutes, winning 6-2, 6-3 to celebrate his third title on ITF World Tennis Tour. He won all of them in Egypt. Simon Carr won his first ITF World Tennis Tour title at the Thabraca Magic Hotel in Tabarka. The 19-year old Irish took down top seed Markus Eriksson of Sweden in the stage of the final four with a comeback win after losing the first set. Runner-up Christian Lindell from Sweden defeated French No. 2 seed and former No. 3 in the ITF Junior rankings Corentin Denolly after two hours and 47 minutes by 2-6, 6-4, 6-4. Capitalizing on five of his 12 break chances, Carr got the win in the title match against the previous ATP No. 177 with 6-1, 6-3. The final lasted one hour and 40 minutes. Jumpei Yamasuki captures the title of the Kashiwa Open 2019 held at Tennis Training Center in Kashiwa to celebrate his second win on Japanese soil in 2019. In the all-Japanese semi-finals the 21-year-old battled past No. 2 seed Makoto Ochi, who had to retire after losing the first three games in the final set. Yuki Mochizuki made it to the final with a straight-sets win against No. 3 seed Yusuke Takahashi. Yamasuki won the final 6-2, 2-6, 6-2 after two hours and four minutes. The former No. 11 in the ITF Junior rankings converted four of his 14 break points, fighting off 10 of the 12 break chances from his opponent. It was the first win for Yamasuki against his compatriot after losing all four previous encounters. This entry was posted in ITF World Tennis Tour, ITF World Tennis Tour News and tagged ITF World Tennis Tour, Pedro Sakamoto.